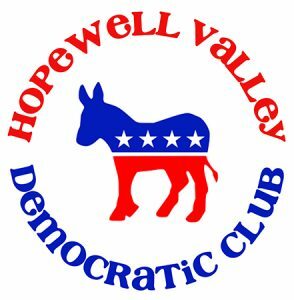 The Hopewell Valley Democratic Club was re-established in 2017 in order to unite all Democrats of Hopewell Township, Hopewell Borough and Pennington Borough (collectively “Hopewell Valley”) into an effective force for progressive political action with the goals of strengthening the Democratic Party at the local, county, state, and national levels, including building a deep bench at the local level; supporting Democratic candidates at all levels, with a focus on local Get Out The Vote; educating citizens on issues, including a focus on youth outreach; and elevating the profile of Hopewell Valley Democrats in Mercer County. The Club also encourages the serious consideration and participation of qualified Hopewell Valley residents for government jobs and appointments on the Federal, State, County and local levels. The Club is governed by a board of between 4 and 15 trustees, which include at least one resident of Pennington, one resident of Hopewell Borough and two residents of Hopewell Township. Additionally, One Trustee seat shall be available for a resident of Hopewell Valley who is currently in high school, providing that he or she is at least seventeen (17) years old or is in his or her junior or senior year of high school. The Club’s day to day operations are carried out by an Executive Board, consisting of the Club’s officers, which include: Chairperson, Vice-Chairperson, Treasurer, Corresponding Secretary and Recording Secretary. The club is registered with the New Jersey Election Law Enforcement Commission as a continuing political committee (“CPC”) and conducts fundraisers, trainings and other events throughout the year, including a monthly “First Friday” morning coffee meet up.